In the beginning, woman was truly the sun. An authentic person. Now she is the moon, a wan and sickly moon, dependent on another, reflecting another’s brilliance. _ _... The time has come for us to recapture the sun hidden within us. These lines launched Seitō, a women's literary journal, in 1911 Tokyo. Hiratsuka Raichō was one of the founders, and she poured her emotions into this opening editorial. Her essay gave voice to frustrations felt by women across the nation, and is now considered part of the canon of Japanese feminism. 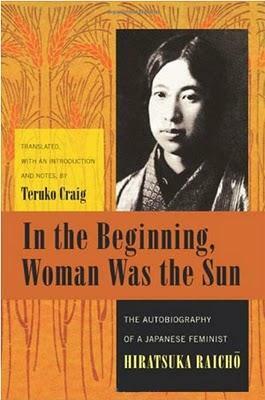 In the Beginning, Woman Was the Sun is Raichō’s autobiography. Teruko Craig has translated the first half of a four volume set, with her own summary of the latter half of Raichō’s life. The book can best be described as a memoir, with more focus on experiences than facts. Raichō did not intend to become a feminist icon. An atypical young girl, she went fishing with her father as a child, and later fought for permission to enroll in one of the few women’s colleges. Throughout her youth, Raichō squirmed under the oppressive dictates of school and family, conventions we would designate now as patriarchal, though she was not thinking in such terms. Raichō was given a remarkable amount of freedom for a young woman. She walked alone to and from school and pursued her own activities. Passionate about attaining spiritual growth, she studied Zen for years. Her interest in literature came late, but when it did she began poring through the classics of European thought. It was a male friend who urged her to found Seitō, "Bluestocking," a literary journal dedicated to fostering women writers. Raichō’s original drive was to inspire women to become their authentic selves. She did not think in terms of men and women, but of people who were denying themselves spiritually. Raichō became a primary manager of the operation, with a team of other young women, and the magazine remained independent during the majority of its run from 1911 to 1916. Those involved were dubbed "New Women" by the newspapers, and their every action was scrutinized. The editorial team constantly walked the line between asserting their rights to act freely and avoiding the condemnation of society and the government, which banned several issues. Raichō narrates her memoir in the voice of a confident woman, never apologizing nor boasting. I felt as though she was sitting near me, telling the story simply because I had asked to hear it. She explains her motivations, even when they are not quite what one might expect from a feminist icon. It was only later in her life that Raichō began to fight for the special rights and responsibilities women have as women, particularly as mothers. She describes this as a maturation of view. Much time is spent on Raichō’s relationships with other writers. Though I was interested in the other women participating in Seitō, there were so many of them that they began to run together. I am sure that, to someone more familiar with the movers and shakers of Raichō’s time, the names will have more meaning, and these insights into their characters will be a gift. Craig points out that as an oral narrative, the text “tends to be repetitious and digressive,” but I rarely found this to be an issue except for these tangential stories. The only thing missing is more of Raichō’s writings. The preeminent “In the beginning…” essay is only excerpted, allowing tantalizing glimpses into Raichō’s mind without allowing the reader to develop a sense of her full meaning. I feel it would have been helpful to have more of what appeared in Seitō as well. As such, In the Beginning, Woman Was the Sun is not a one-stop-shop for learning about Japanese feminism. There is a good sense of history and the larger changes in Japanese society at the time, but only in relation to Raichō and her projects. Her motivations and intentions are explained, but her work is not allowed to speak for itself. Nevertheless, the book sheds light on a time and a place that few would think of as progressive in terms of women’s rights.